We maintain your instruments with the care they deserve. 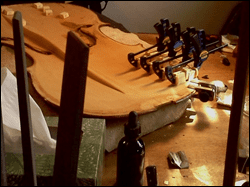 Bow repair requires different skills and tool set to that of violin repair. 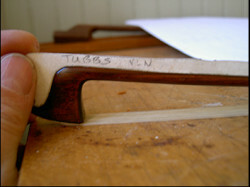 Whenever possible, have your bows worked on by a skilled bow maker and restorer. A bow may become greatly affected by even small changes to its design. It is recommended that you have someone who is experienced in making and restoring bows to assess how to repair and make corrections in the function of your bow. You can make an appointment for a same day or even a “while-you-wait” re-hair. We have several types of premium natural horsehair for you to choose from to suit your taste and style of playing. New grips, replacing eyelets, bushing worn holes, replacing tips, repairs to the ebony or stick are some of the many services we offer beyond rehairs.